Punjab, an exuberant and fertile land of five rivers. During the days of Rig-Veda this land was called ‘Sapt-Sindhu’ – the land of seven rivers namely - Sindh, Jhelum, Chenab, Ravi, Beas, Sutlej, and Saraswati. The history of Punjab goes back to the times of Indus Valley civilization or the arrival of the Aryans. Lord Rama was born at a place called Ghuram, now in Patiala district. Lord Sri Krishna delivered the immortal message of the Gita at Kurukshetra, which was well within the boundary of Punjab till very recently. Sikhism is the youngest of the religions practiced in India. Guru Nanak was the founder of Sikhism. 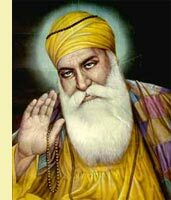 Guru Nanak tried to bring about an understanding between the Hindus and the Muslims in those times when the hostilities between the two were on the rise. He was deeply influenced by the Bhakti movement and the teachings of Kabir. The Sikhs have ten Gurus. The last Guru, Guru Gobind Singh, organized the community into the Khalsas, a militant order and abolished the institution of Guru’s. The holy book is called the Granth Sahib, containing the writings of the last five Gurus. Guru Gobind Ji prescribed the five sacred Sikh symbols - The 5 Kakkar's for his Khalsa to wear at all times. Kesh : Uncut hair, as Guru Ji said, was the symbol of saintliness. Kangha : A wooden comb that keeps the hair fixed in place at all times. This is a symbol of cleanliness. He asked his followers to tie turban at all times to protect hair and have a social identity. The comb in hair indicated a disciplined spirituality. Kara : A steel bracelet worn on the right wrist. It symbolizes the Khalsa to restrain from evil deeds, which might bring disgrace. Kaccha : The short trousers called Kaccha. Kaccha was more sensible for a warrior to wear instead of flowing robes or other similar garments of the period. Kirpan : The warrior sword - an emblem of self-defense and courage. It symbolizes capacity and preparedness to defend the oppressed at all times. A folk song is essentially a subjective expression of the emotions walling up from the depths. It borrows its metamorphous and imagery from the simple things in life. They are simple, charming and full of the sincerity of emotion, the purity of feeling. 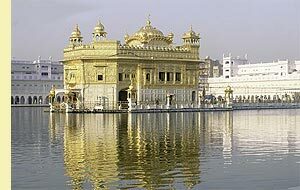 Songs About Religion, Cult And Sacrament - The Punjab is inhabited by people of different sects, religions and cults which have their own modes of prayer and worship. Songs Related To Rituals And Ceremonies have a great cultural significance. They are more an expression of the deeply felt emotions of the community as a whole and not of an individual. These songs are generally sung in groups. Mahiya, sung while at work, especially by the farmers toiling in their fields. A triplet of Mahiya is called Tappa because it throbs with the heart-beat of the singers. Dhola, an equally popular form of folk music, is highly lyrical and sentimental in character, love and beauty being its chief contents. Boli, a kind of couplet, is the most miniature form of folk-song in vogue. Boli, however, is very deep, effective and interesting in its impact. Songs Of Trinjan - Women seldom sit idle in Punjab. When they are free from household chores, they bring out their spinning wheels and sit out in the open under a tree. Songs Of Teeyan - is an occasion for all married girls to visit their parents for a few days, and thus enjoy again the carefree days of their childhood. Songs of Teeyan mostly speak of love and are highly charged with emotion. 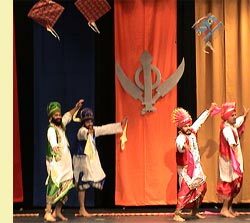 Folk Songs Of Battles - Considering that for centuries the Punjabis had to bear the brunt of foreign attacks, some folk songs have a historical significance and reflect the attitude of the entire community towards certain events. Paper mache utensils made by mixing paper and various kinds of earth, for storing house hold necessities in colourful designs. Basketry - weaving of vegetable fibers and making of wicker articles for daily use are among the oldest creations of human hands. Leather craft - Punjabi Juttis are embroidered with gold and silver wires all over in different patterns covering every parts of the pair so that it looked as if it was made of solid gold and silver. Ornaments of great diversity found from archaeological sites make a fascinating study. We come across several pieces of ear ornaments, which can be divided under several groups like ear-tips, ear-studs, eardrops, earrings and ear-pendants. It seems that for every part of the human body a special ornament has to be provided. It is not surprising that jewelry was used as much by men as by women though more sparingly by the former. The Golden temple in Amritsar. The sacred Sikh sanctuary, marbled, bronzed & covered with gold leaf wherein the Guru Granth Sahib- The Bible of the Sikhs is placed reverently. Qila Mubarak Patiala - was also the residence of Patiala dynasty. The Sheesh Mahal, Patiala - built in the reign of Maharaja Narinder Singh (1845-1862) in a forest with terraces, gardens, fountains and an artificial lake. Govindgarh Fort Amritsar - early 19th century designed by Maharaja Ranjit Singh. Bathinda Fort - Schooner shaped fort stands like a ship in a sea of sand. Faridkot Fort - Reputed to be 700 years old. Qila Mubark Patiala - founded in 1764 by Maharaja Ala Singh. Bhadurgarh Fort - originally founded by Nawab Saif Khan in 1658. Anandpur Sahib Fort , Ropar - Anandpur Sahib was defended by five forts.